Tag Archives for " 4-2-3-1 "
Spain’s formation is a source of great debate and intrigue. Is it a 4-3-3? Is it a 4-3-3-0? Is it a 4-6-0? Is it a 4-2-3-1? Is it a 4-2-4-0? Is it a 4-2-2-2? I think it’s a combination of the above. Some matches they will ensure they have a central striker, generally Cesc Fabregas, who will rotate this role with David Silva, with Xavi and Iniesta floating around the space between midfield and defense. They play with a narrow attacking 4-2-3-1 or a narrow 4-3-3 as Alba and Arbeloa do a great job or providing width very high up the field and allowing Spain to regularly outnumber teams between defense and midfield, allowing them to play between the lines frequently. In the final where Spain played undoubtedly their best football of the tournament, they played a combination of 4-3-3 and 4-2-3-1, and Xavi’s position dictated the shape. In some attacking phases with the ball in the opposition half, he would drop deep and 2 of the 3 of Silva, Iniesta and Cesc would play in between the defense and midfield with Alba and Arbeloa the full backs on the outside, with the other of the front 3 staying as a central striker. 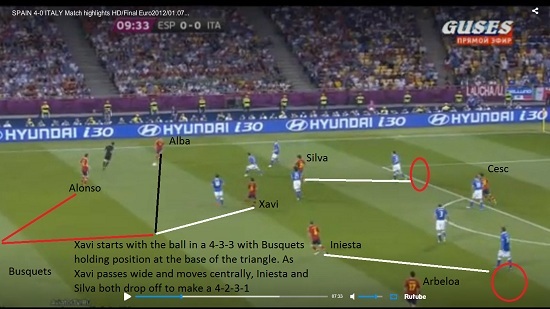 In some defensive transition phases, Spain would revert to a 4-2-3-1 with Alonso and Busquets screening the defense, with Xavi, Iniesta and Silva pressing in front, with Cesc as the main striker. When they win the ball back, they would stay in this formation and confuse the opposition as players positions and the marking responsibilities have changed again.